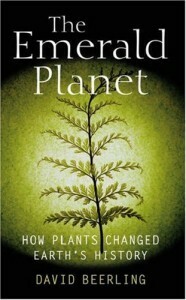 David Beerling is passionate about plants and their role in shaping the Earth, and this is clearly evident in his book The Emerald Planet: How plants changed Earth’s history. The book follows in loose chronological order how the evolution of plants and their colonisation across the Earth helped facilitate the evolution of the planet; its atmosphere and geology, and also its ecology. In the beginning there were photosynthetic organisms and plants grew from these, give or take about 40 million years of evolution or so. Beerling begins his work with a chapter devoted to how plants at the beginning of their development on Earth helped set about a change in the atmosphere, increasing oxygen levels and dramatically decreasing levels of carbon dioxide. This first chapter is an enjoyable and easy to follow journey, citing the evolution of leaves, the early fossil record, and noting the fortunate placing of the Earth in a ‘temperate’ zone around the sun allowing water to exist in its liquid form. The book then takes a fascinating look at ‘the lost world of giants’, a time in Earth’s history 300 million years ago when oxygen levels in the atmosphere were at 30%. Describing the huge Carboniferous flora and fauna, giant winged insects and water scorpions 1.5 meters long, this chapter attempts to explain how the development of gigantic plants helped bring about gigantism in the ecology of the world. Beerling states that this in all probability this was due to the unprecedented levels of oxygen in the atmosphere, with laboratory tests on flies demonstrating that when bred under higher oxygen and pressure conditions the flies grew 14% larger than is typically normal. The rest of the book goes on to focus on an ancient global ozone catastrophe, the global warming that ushered in the dinosaur era, and, most interestingly of all, the ancient forests of Antarctica, a lost world now covered by kilometre-thick ice. The role of plants in all of these episodes in Earth’s history is explained and presented in a way that has some resonance for today’s climatic conditions. To finish, there is an extensive list of references, information and notes in the back for anyone who wishes to further explore this fascinating subject. The Emerald Planet proved to be an interesting and enjoyable read. It provides many pertinent observations on the role of plants in Earth’s past and present, as well as their likely effect in the future, and by extension other possible inhabitable terrestrial planets in the galaxy.